This past summer our group Boston Handmade had a barbecue at Mimi's (MCK254) house. We got to bring our loved ones, hang out, and eat delicious food. Along with the gathering we decided to throw in a material swap. I brought a couple of bags of fabric and swatches. As more people arrived the less room there was in Mimi's front hallway. 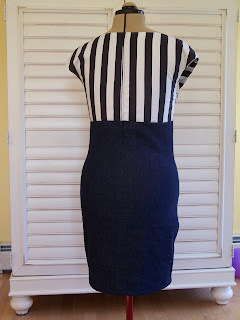 I spotted some black and white striped fabric. Now I'm a very colorful person and try to stay away from black fabric because I wear enough of that color. Ideas started to pop up in my head of what I could make with it. I don't know who brought but I'm dying to know. I think it was Crystal of Vintage by Crystal. Well here is the finished product! 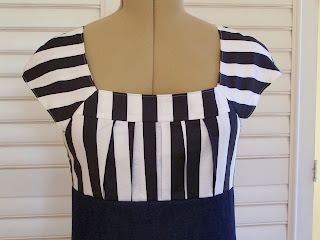 I paired the black and white stripe fabric with denim and made a retro style dress. I hope to find out who brought the fabric and thank them. I hope they like what I made with it. My family and I had a wonderful time and even the kids walked away with some treasures. This is just soo cute! 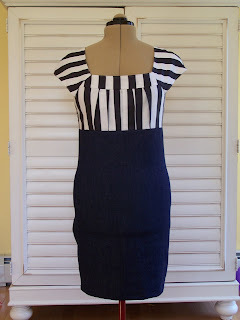 Great dress! let me know Mimi. Thanks for the comment Carrie and welcome! soooo cute, beth! i love it! very retro and pinup-y!